Ruth B. (Richardson) Beard, 78, of Cambridge, MA. and formerly life long resident of Spofford and Keene passed away in her sleep on Wednesday, October 17, 2018 in the comfort of her home after a short period of declining health. Ruthie was born on June 8, 1940 in Keene, NH. She was the daughter of the late Grace May (Parker) and Halton James Richardson Jr. Ruthie was a 1958 Keene High School graduate. She began her career at the Elliot Hospital in Medical Billing. She worked in various jobs in the community, including time with the SAU 29 as a cook while her children were in school, but her most rewarding employment was working alongside the late Dr. Homer L. Ash as his Dental Assistant. 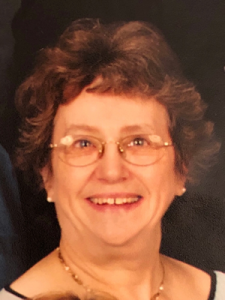 Ruthie was a longtime 4H Youth Development Leader, teaching sewing, baking, and crafts, and served as Secretary and Treasurer for the UNH Cooperative Extension Group. On September 5th, 1966 she exchanged vows with Robert H. Beard at Saint Bernard Church in Keene. They were married with family and friends in attendance and have been married for fifty-two years. She loved traveling to coastal Maine and spent many vacations visiting her children in Hawaii, Scotland, California and Chicago. Ruthie was the treasured cook in the family. “Grammy noodles” and chex mix will be especially missed. She was an avid gardener and knew how to find a great tag sale. She will be remembered for her big smile, contagious laughter, and unconditional love for her family. Her favorite people called her “Mema” and “Grammy” and she showered them with love and hugs, her eyes lighting up when seeing them or simply hearing their names. A favorite saying of hers was “Time will tell,” and Ruthie was known to generously and selflessly share her time with family. She also said “Toodaloo” to loved ones in place of goodbye. Toodaloo, Mom. You will be dearly missed and never forgotten. Ruthie is survived by her husband, Robert Harlan Beard, of Keene. Her 3 beloved children and their spouses are: Robin Marie Beard, of Watertown, MA, Richard (Ritchie) Harlan Beard and his wife, Tracy Michelle (Toscano) Beard of Keene and Renee Lynn Beard and her husband Adam Zachary Bard, of Cambridge, MA. She leaves 5 cherished grandchildren, Lucas Michael, Joel Anthony and Katherine Grace Beard, of Keene, and Aryeh and Asher Bard, of Cambridge, MA. She is also survived by a strong network of wonderful cousins, nieces, nephews, extended family and friends. She is predeceased by her loving brother Halton (Harley) James Richardson, III. A graveside service with Christian Burial Rights will be held on Saturday, October 27, 2018 at 9:30am. in the family lot at Bradford St. Cemetery, Keene, NH. 03431. A rememberance celebration will be held later that day from 3 to 5pm. with a time of reflection, memorial words of compassion and selected music from 4 to 4:30pm. all in the funeral chapel. While the family is happy to receive plants in Ruthie’s memory, they would appreciate donations sent directly to Tribute Home Care, 24 Cambridge Street, 2nd Floor, Charlestown, MA. 02129. All services are under the care of Cheshire Family Funeral Chapel and Crematories, 44 Maple Ave. Keene, NH. 03431.